How to calculate loads for robotics mechanisms. How to build a specific mechanism such as a drive train or lifting arm. How to best use specific robotics components in designing a robot. How to use programming with the hardware to accomplish a specific task. How to use CAD software to design and test your robot before it is built. Only one entry per challenge is permitted by the same person (if an individual entry) or team (if a group/team entry). Each team in a multi-team school or club program may submit an entry. For example, teams 123A and 123B could each submit a video, but team 123A could not submit two videos. Create and post to YouTube a video focusing on teaching a new team some aspect of the science, construction, engineering, and/or math of designing and building robots, up to three minutes long. At the end of the video, there must be a credits section which includes the name of the entrant or entrants, the team number, and the name of the video, plus any other information the creators want to include (software used, recognition of sponsors, etc.). The credits should be no longer than 15 seconds (Total allowed video length is 3 minutes 15 seconds with credits included). Note: This challenge is about the best practices for designing and building robots, focusing on the robot. Documenting a process, such as the Engineering Notebook, is NOT part of the scope of this year's challenge. Judges will select at least ten finalists from the submitted entries, and will take community voting results into account in making their choices. 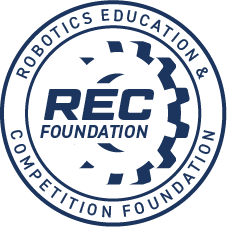 The finalist submissions will then be judged by additional selected professionals whose scores will be combined with the preliminary-round judges’ scores to determine the winner of the REC Foundation STEM Educational Video Challenge. How to construct a particular kind of robotics mechanism. Doing the math of robotics design – gears, loads, speeds, size, weights, etc. How to use an engineering approach to solve a specific robotics problem (with robot parts, not documentation alone). How to use a certain part or parts to build robotics mechanisms. How to measure robotics actions. Using programming and hardware together to accomplish something with a robot. Other STEM aspect of robot design and construction – as long as it is about designing and building robots, it is appropriate. The entry provides real solutions to the STEM issues facing competition teams. The video effectively states its goals and achieves them. The video is easily understood, clearly presented, creative and is enjoyable to watch. Video is of high production quality, with good video, editing, and sound (all music must be in the public domain).